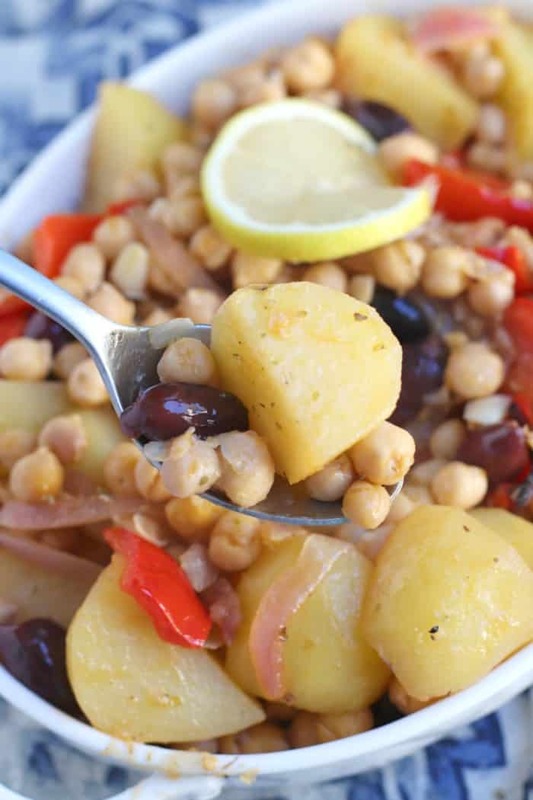 Greek Lemon Roasted Potatoes with Chickpeas is a flavorful one-dish meal. This easy family-friendly recipe is vegan and gluten-free. I love the flavors of Mediterranean-inspired food. Simple ingredients come together to create amazing flavors. And it’s such a healthy way to eat. Some of my favorite dishes to make at home include Grilled Eggplant Salad, Pasta with Zucchini, and Greek Millet Salad. But years ago, I used to make a Greek recipe that was one of my go-to dinners. It consisted of potatoes and chicken baked in a marinade of lemon juice, olive oil, garlic, and oregano. I made it so often, I had it memorized. In fact, I don’t even remember how I first learned the recipe. 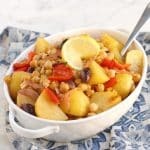 But now I’m excited to share a vegan version of this one-dish meal! Greek Lemon Roasted Potatoes with Chickpeas is easy to make. Most of the time it takes to make it is hands-off. This means the majority of the time, this dinner can be left unattended while you do other things. While the total time is about three hours, two of these hours are for marinating. And the other hour or so is for roasting. Now, you may be thinking you don’t have time for this. But you can place the ingredients in the marinade in the morning or even the night before. I like to use a gallon zipper freezer bag. Then place the marinating vegetables in your refrigerator. Not only will you achieve maximum flavor, but then in the evening, just turn on your oven and relax while everything cooks. All you need to do is stir everything half way through roasting. This is also a great recipe to make on the weekend so you can enjoy it for lunches during the week. You only need a few ingredients to make Greek Lemon Roasted Potatoes with Chickpeas. As you probably guessed, this recipe requires potatoes. I like to use medium-sized gold potatoes. And while I almost always leave the skin on potatoes for the nutritional value, I do peel them when making this dish. The reason I do this is because I want the potatoes to absorb as much of the lemony marinade as possible. Which brings us to the next ingredient, lemon juice. And while fresh is best, I won’t tell anyone if you use bottled. The other ingredients for the marinade include olive oil, vegetable broth, fresh garlic, dried oregano, and salt and pepper. In addition, you’ll need chickpeas. I take a short cut and use canned. And I like to add a red bell pepper and an onion. But feel free to experiment with your favorite vegetables. Finally, since I’m a big fan of olives, I add some jarred pitted Kalamata olives. I’ll leave it up to you to decide if you want to include them. Greek Lemon Roasted Potatoes is a complete meal. I love the combination of vegetables and legumes. It’s such a satisfying and comforting dinner. But if you have extra time, you can eat Greek Lemon Roasted Potatoes with a salad or side. If I’m serving guests, I like to make a Vegan Tomato Cucumber Feta Salad, which can be prepped in advance. Or if you want to offer a green vegetable, Sauteed Green Beans with Tomatoes and Garlic is a great choice. 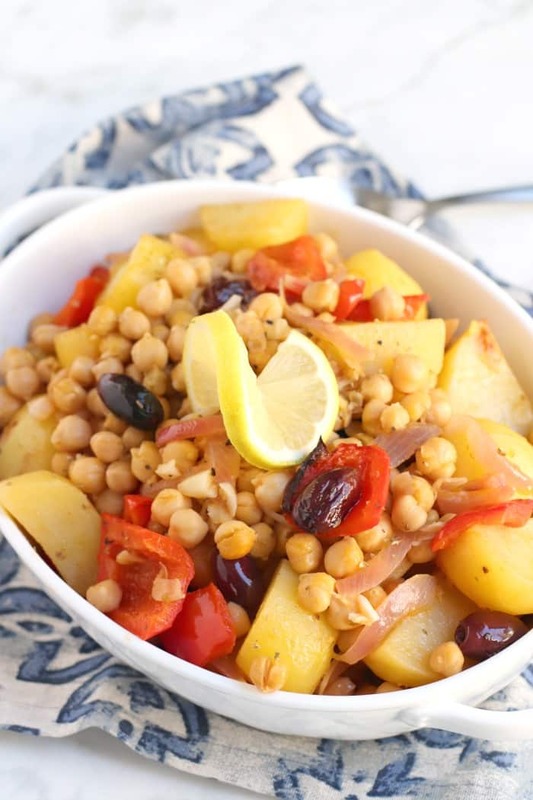 Chickpeas (Garbanzo Beans) are a perfect compliment to Greek Lemon Roasted Potatoes. This legume is high in fiber and protein. It’s also a great source of vitamins and minerals including folate, calcium, magnesium, and potassium. And chickpeas make you feel full when you eat them, keeping your appetite in control which may help with weight loss. In fact, there are so many great things to say about this bean, I suggest you read this comprehensive article to learn more. Now let’s make Greek Lemon Roasted Potatoes with Chickpeas! 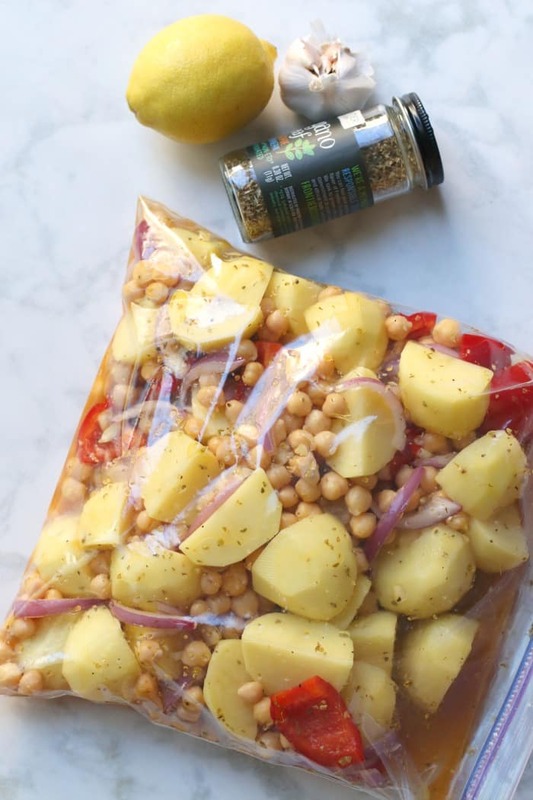 Place the potatoes, chickpeas, bell pepper, onion, lemon juice, olive oil, vegetable broth, garlic, oregano, and salt and pepper in a resealable gallon freezer bag or large container with a lid. Toss to combine the ingredients together by shaking the sealed bag or container. Place in the refrigerator to marinate for at least two hours (or overnight). Transfer the ingredients with the remaining marinade to a large baking dish. (Line with aluminum foil for easier clean up, if desired.) Add the Kalamata olives and toss with the ingredients in the dish. Bake in the oven, uncovered, at 400 degrees F for an hour, or until the potatoes are tender and lightly browned, stirring half way through. Enjoy! I can’t wait I make it again, and share it with friends! I’m so glad everyone enjoyed it, Lisa! So so so good! Instant hit with the family, this is definitely going in the regular rotation! Thanks Bree! I’m so glad everyone enjoyed it! I hope to try this soon with some vegan coconut yogurt! I’m cooking for 1, so do you think it would be better to halve this recipe or could it freeze well? Hi Hayley, I don’t think this dish freezes well. I would either eat the leftovers during the week, or you can make half the recipe. Enjoy!